Firstly, I do need to warn you, I am going to do a lot of gushing about this book – so much you’ll probably get bored. This is book three in the “Wild Warriners” series, where we get to know four devilishly handsome and so-called wild brothers and I can say that this next foray into their glittery and sometimes dark world is just as heart-warming, tantalizing and as pure as the others. In fact, I would say that this could be the most anguished book I have read by Heath and I love the dynamics of the whole story from the relationship between Joe and Bella to the history and intrigue of what is going surrounding them and their little community. It is a wonderful addition to this series! Lady Isabella Beaumont – or Bella, to try to get on with her life after a barbaric attack on her a year ago she is volunteering at Dr Warriner’s infirmary and foundling home – that has been set up by none other that Letty Warriner. She hopes that if she gets herself out of the confines of the house and actually do something useful she will get better or as her family say, get over it. Bella is happy doing her jobs within the infirmary, once she was the life and soul of a party but now she is a shell of herself and she just wants to fade into the background and let her more exuberant and beautiful sister; Clarissa take centre stage. Bella really got to me, there was something about her fragility that really touched me. She is a scared and broken young woman who experienced something that no-one should ever have to experience, and because of that brutality she is now a shell of her former exuberant self. But it wasn’t just the attack that has caused such fear and skittish-ness in Bella, it was how people – especially doctors – tried to “treat” her, poor Bella the quacks scared the living daylights out of her. Joe Warriner is the brainy brother all he wants to do is help the people, but due to his families tarnished name that is a lot easier said then done, but due to his two older brothers marrying and they are all working tirelessly to bring a little respectability to their blackened name. With his two older brother’s Jack and Jamie doing all manner of good things for the community; Jack and Letty founding the Infirmary and foundling house while Jamie and Cassie are bringing joy to the town with their wonderful Orange Blossom books and Joe is striving to be a good doctor. He is also obsessed with Lady Clarissa Beaumont, he is dazzled by her beauty, but being a stroppy little madam, she doesn’t see Joe – but her sister does! As Bella and Joe work together at the infirmary and foundling house, their friendship blossoms into something more tender. Joe at first sees her as nothing but a bit of a cold fish, she is serious and irritating and nothing at all like her ethereal sister, but that view of her soon becomes replaced with awe and wonder and more importantly love. Bella begins to feel thing’s for the handsome doctor that she had never thought to feel, he is like a soothing balm to her fractured soul and I do have to say that those moments when he is gaining her trust, those little touches that she allows him are so heart-warming. I think in some ways Bella envies just how close all the Warriner’s are, her family as much as they try, they are just the same as so many other stuffy aristocratic families. They are proud people and I found that at times they were very cold. Her mother, I think is a lot more like her daughter, she has a bit more fire. Bella wants what Joe has with his family, absolute love and devotion to one another – which as we know the Warriner’s are something very special indeed. Out of all the brothers he is the one that is a bit of an enigma, he is ridiculously intelligent – there is no doubting that and what I really like about him is how excepting he is of modern idea’s, how he experiments with new age ways and medicines, he really is a man who is at least a hundred years ahead of his time. Behind those steely blue eyes is a determined man, but even though he seems so much more level-headed than his brothers there is something lurking within our doctor that you really would never have expected. When truly cares about a person like he does Bella then again you see a completely different side of this quiet man emerge, a man who is fire and brimstone and who will do anything to protect her. If you think Jack and Jamie are hot-blooded and testosterone fuelled men, then just wait until you see Joe lose his temper. This is very romantic there is no question about that in any way and yet, it is very different to the previous Warriner’s. Instead of wham-bam straight into bed, this is a lot more restrained because of Bella’s past experiences she has a lot of issues that she needs to overcome before she can really let herself be easy in a man’s company and Bella’s trust is hard-won by Joe. Their relationship smoulders below the surface and you wait with bated breath for that moment when he has win’s her trust, which is a really lovely moment. You feel your eyes filling up with tears of pure undiluted happiness and you think; Yes, at bloody last! Let me just say that younger brother Jake is a hoot. I didn’t really appreciate his tenacious, fun-loving personality in the previous Warriner books – I suppose because he as younger, and I had my eyes on fixed firmly on Jamie. But, Jake is a real rake, he is as law upon himself with the best on liners. The chemistry between the two younger Warriner’s is especially fun and you can really see Heath’s legendary humour and wit coming through with Jake – and I am looking forward to seeing what happens with this rake. That vile and sadistic reverend Reeves is back again causing more trouble, shooting more poison from his vile and acidic tongue. I tell you now, I have never hated a character as much as I do the revolting reverend and, yet his presence give an already wonderful story an unsettling and thrilling twist – and there are twists! What I particularly like about this one is Heath’s attention to detail each little twig of the story is fabulously entwined with fact’s, all the medical facts from the era is sharp and clearly focused. The hours of research, blood sweat and tears that Heath would have gone through to create this beauty really shows in her excellent writing. This is generous with historic detail and facts that pull you into the story and keeps you transfixed, right to the last page and then you’re in some sort of limbo wanting it to keep going. This is unbelievably good, I can definitely say that Joe rivals my favourite brother; Jamie for attention. I cannot recommend this enough, it is a must read! A Warriner to Tempt her is release on 24th January and can be pre-ordered now at Amazon. 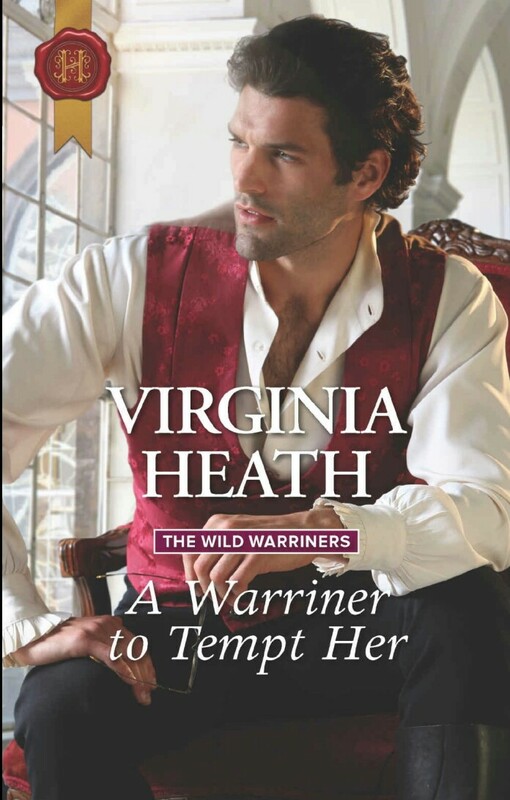 This entry was posted in ARC, Historical Romance, Mills and Boon/Harlequin, Regency, Reviews and tagged A Warriner To Protect Her, A Warriner To Rescue Her, A Warriner to Tempt Her, ARC, Harlequin, Historical Romance, Mills and Boon, Regency, The Wild Warriner's Seres, Virginia Heath.